This page is going to tell a partition tool which enables you to extend boot partition on Windows Small Business (SBS) 2003. Download IM-Magic Partition Resizer Server to expand the boot partition on SBS 2003 when system reports low disk space. Low disk space problem often bothers the administrators of Server computer, especially when the boot partitionhas low disk space . If you don't want to affect the performance of your PC due to low disk space problem, you need to extend the boot partition with third-party partition software. IM-Magic Partition Resizer Server is designed for every Windows Server user to resize hard disk when running into low disk space problem on any partition. This partition software allows users to extend boot partition system partition without touching any information on the PC. Download, install and launch IM-Magic Partition Resizer Server. 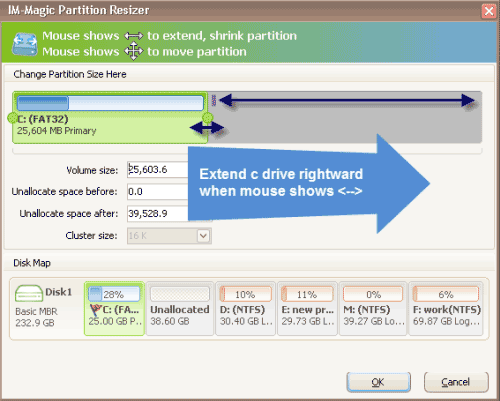 Right click a partition that has much free space and choose "Resize/Move". You need to move the unallocated space close to boot partition. Then, right click the boot partition and choose "Resize/Move" option. Move the arrows to add the unallocated space to boot partition and click "Apply" button. "I have a SATA hard disk on my PC with SBS 2003 system. I had divided the hard disk into two drives. C drive works as boot partition and system partition, while D drive works as common data partition. Recently, SBS 2003 frequently reports low disk space warning message on the boot partition, so I bought a new hard disk yesterday and added it to the PC. 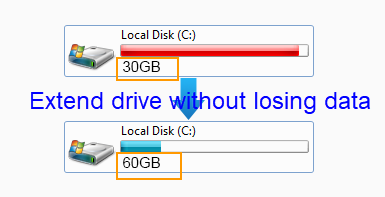 What I want to do is to move all data from the D drive on SATA hard disk to the new hard disk, and then I want to add the space on D drive to the boot partition. Can you tell me how to extend the boot partition by moving free space from another partition??" "The C partition runs on low disk space on Windows SBS 2003. Since C drive is also boot partition, I am wondering if I need to reinstall system to resize the hard disk. Is there any way to resize C drive without reinstalling system on Windows SBS 2003?" Simply say, a third-party partition tool is necessary if you want to extend boot partition without reinstalling system. The IM-Magic Partition Resizer Server allows you to resize hard disk and reallocate disk space to boot partition when it is running out of disk space on Windows Server. By using this partition software, you don't need to worry about system crash or any other disaster because it provides 100% safe way to resize hard disk. The partition software works with all brands of hard disks when you encounter the low disk space problem. A boot partition often contains the boot sectors which are responsible for booting the Windows OS. If there is anything wrong with the boot partition, you may fail to boot the OS. Therefore, it is quite important to look for a secure method to extend boot partition in order to protect the boot partition corrupted. IM-Magic Partition Resizer Server can extend the boot partition safely without touching any file on the boot partition, so you can completely rely on this Windows Server partition manager and partition magic when running into low disk space problem on SBS 2003 or other Windows Server. Most people often confuse the boot partition with system partition, but as a matter of fact they have different definitions. For example, if you copy all files on the C drive of other's computer to the C drive of your own computer, you still cannot boot this system. Based on Microsoft definition, system partition refers to the partition that contains the boot loader which is responsible for booting operating system. System partition and boot partition can be (but not must be) on the same drive. Boot partition refers to the partition that operating system folders and Windows OS supported files. Generally speaking, system partition is the partition which is used to save all kinds of boot files, while boot partition is the partition which is used to save Windows system root.